A cake decorator could easily fill up an entire kitchen with specialty baking pans, tools and utensils, but many dishes you already own can work double duty for cakes. Pyrex bowls are oven-safe, and the smooth interiors can be used to make egg-shaped or half-spherical cakes instead of purchasing a separate cake pans to take up space in your cabinets. 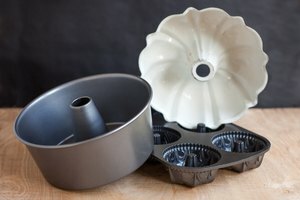 The range of cake decorating options with Pyrex bowl cakes is limited only by your imagination. Observe the shape inside the Pyrex bowl, usually spherical or oval, and use that as inspiration for your cake design. Create an out-of-this-world moon or planet cake with a large Pyrex mixing bowl. Make an edible cake volcano with a cake baked in a large oval Pyrex bowl. 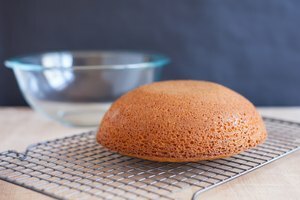 Oval-shaped cakes baked in small Pyrex bowls can be decorated to look like large dinosaur eggs with a base frosting color and small speckles throughout. A round or oval bowl works well to make the ball gown base for a princess cake. Push the legs of a small child's doll through the center to make a princess standing in a cake ball gown. 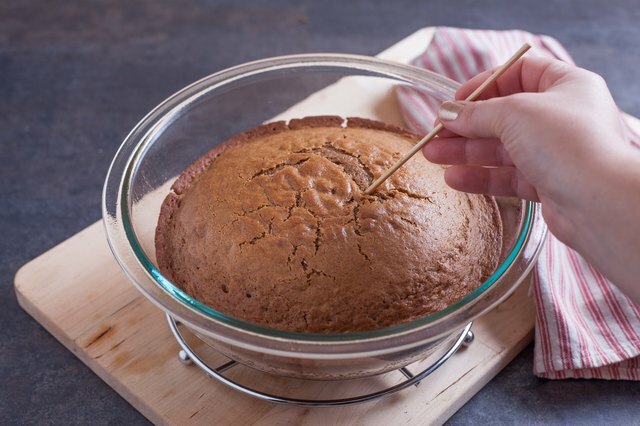 It might be tempting to mix the cake ingredients in a Pyrex bowl and pop it directly in the oven, but the cake will stick to the inside of the bowl just as it would stick to an unprepared cake pan. 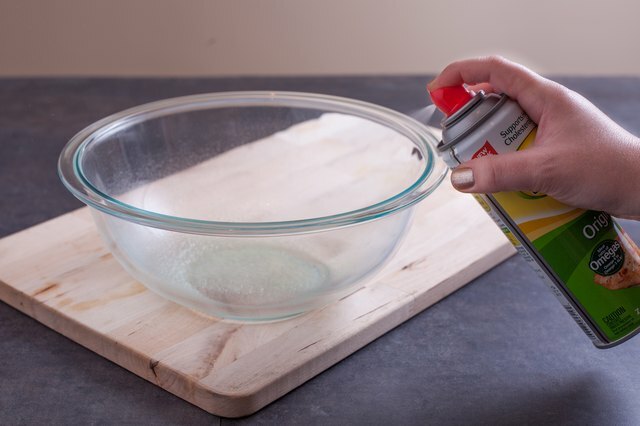 To prevent sticking, spray the inside of the Pyrex bowl with nonstick baking spray before adding the batter. Alternatively, coat the inside with vegetable shortening and dust it with flour to prevent sticking. Fill the pan no more than about one-half to two-thirds full to leave room for the cake to rise as it bakes. 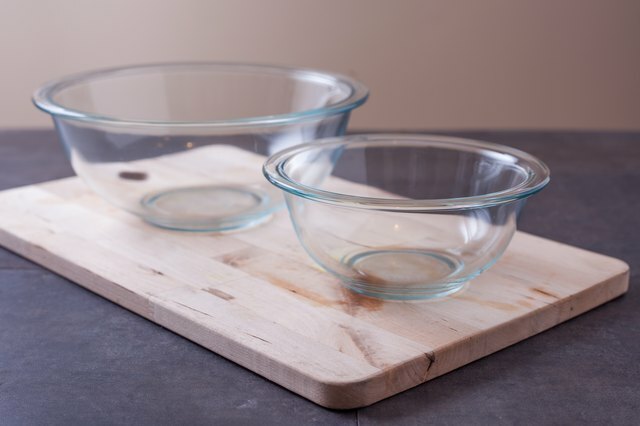 Make sure the bowl is at room temperature when you place it in the oven because Pyrex bowls are prone to thermal shock and can break when they undergo rapid temperature changes. Thermal shock is especially problematic with new Pyrex made from soda-lime glass instead of the borosilicate glass in retro Pyrex bowls. A Pyrex bowl's size and shape set it apart from other baking dishes, so you'll need to tweak your baking routine. 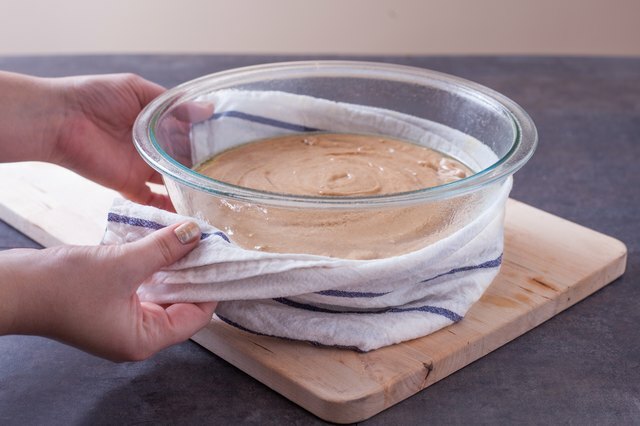 In a 9-by-13-inch baking dish, for example, the batter is shallow and spread across a wider surface area, which means a faster baking time than narrow, deep cake batter in a Pyrex bowl. The center of the cake takes much longer to bake than the edges, so reduce the oven temperature by about 25 degrees Fahrenheit. 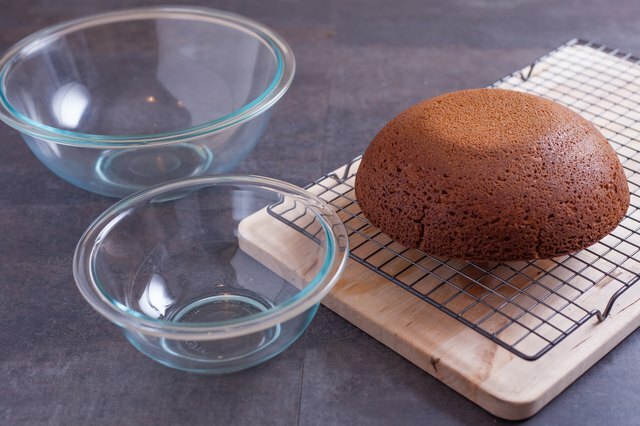 You can also prevent burning the outside and make the cake bake more evenly across the top by wrapping the bowl with a damp kitchen towel to keep the outside cool. The increased batter depth and decreased baking temperature requires a longer cooking time than shallow baking pans. The smallest Pyrex bowl, 1 1/2 pints, requires 35 to 40 minutes of baking time, while the largest 4-quart bowl can take 1 or more hours. Check the cake periodically to see if it's done, beginning at the time indicated on the recipe for a regular cake pan. Insert a wooden skewer or cake tester in the center of the cake. The cake is done when it comes out clean or with just a few crumbs. Consumerist: Why Pyrex Bowls "Explode"